So yet again people with mental illness find themselves subject to stigma. 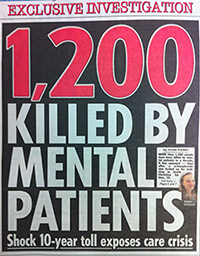 On Monday 7 October 2013 The Sun newspaper alleged in a full page headline that over a ten year period 1,200 people had been killed by “mental patients”. The wording “mental patients”” mirrors the hugely inappropriate fancy dress costume which ASDA and Tescos were forced to withdraw from sale on their websites (be a third party). Not only was the language stigmatising and the period to which the figures applied much smaller than the sensational headline but they were simply wrong. The figures are taken from the The National Confidential Inquiry into Suicide and Homicide by People with Mental Illness (NCISH). This is a programme, based in Manchester University that has been running over the past ten years. The data actually shows that over that period 1,200 people have been killed by individuals subsequently found to have a mental illness. The number of patients (i.e people in contact with mental health services, perviously diagnosed with mental illness) was significantly smaller. The average number of homicides per year is around 74 for the UK as a whole and that has been falling since a peak in 2004-2006. This is an important distinction when you look at the wider picture. 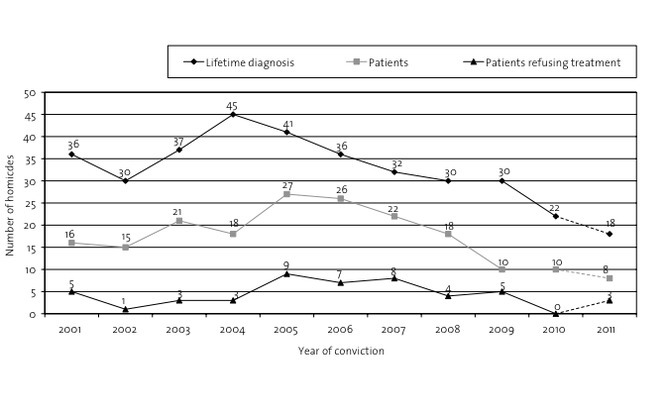 In a British Medical Journal paper from 2004, individuals who killed a person unknown to them were less likely to be known to people with mental illness or to have been patients with mental illness than perpetrators of homicide in general. These homicides were most likely to be men killing other men in violent attacks carried out under the influence of alcohol and/or drugs. The 2013 NCISH report showed that patients with mental illnesses were more likely to kill those known to them (62%) than strangers (17%). It is worth looking at this question from the opposite perspective. Are people with mental illness more likely to victims of homicide? A Swedish study showed that people with mental illness were at a five times greater risk of being a victim than the people who did not have a mental illness. 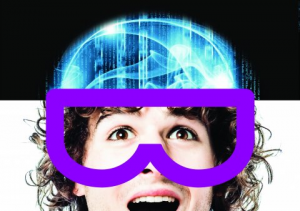 “With an assist from an overly ambitious psychiatry, all human difference is being transmuted into chemical imbalance meant to be treated with a handy pill. Turning difference into illness was among the great strokes of marketing genius accomplished in our time. The founding father of psychoanalysis, Sigmund Freud is shown here in an edited collection of clips from the Freud family’s home movies. The narration is by his daughter Anna Freud, a psychonanalyst herself who along with Melanie Klein was one of the originators of psychoanalytic child psychology. As part of their SSC on of our NUMed Stage 4 students compared the drug street names and patterns of use in the UK and Malaysia. They have kindly made their presentation available to share. You can download the file here. Do No Harm: Why do some people want to cut off a perfectly healthy limb? A type of mental illness, a somatoform disorder, wherein the affected person is concerned with body image, manifested as excessive concern about and preoccupation with a perceived defect of their physical features. The person thinks they have a defect in either one feature or several features of their body, which causes psychological distress that causes clinically significant distress or impairs occupational or social functioning. Often BDD co-occurs with depression and anxiety, social withdrawal or social isolation. Website Matter have opened up for general reading an article about a person with this disorder which is well worth a read. Incidentally, I was attached to the Scottish surgeon mentioned in the piece when I was a medical student and then returned to work for him in my first house job. A Scottish surgeon named Robert Smith, who practised at the Falkirk and District Royal Infirmary, briefly held out legal hope for BIID sufferers by openly performing voluntary amputations, but a media frenzy in 2000 led British authorities to forbid such procedures. What is it like to be a psychiatrist? A Twitter feed I follow (@brainpicker) drew my attention to a blog written by a doctor with Alzheimer’s. I could try and explain what it’s about but the easiest and most eloquent way to do so is actually to quote the blog author himself. The blog “Watching the Lights Go Out” is well worth the read. One of the ways in which mental illness has such a negative impact on people’s lives is by driving them to withdraw from social contact,out of employment and in a downward spiral of self recrimination and loneliness. A potent way to redress the damage is through work placements. These can help rebuild self esteem, reintroduce social activities and by showing an ability to sustain and perform at work allow return to an open workplace. On such scheme is Recycle-a-Bike, designed to help people overcome their mental illness. A film “From Ashes” tells the story of Pete, who was diagnosed with mixed anxiety-depressive disorder, and how he is now at peace with himself. Pete is working now, in a Recycle-a-Bike bicycle repair workshop.